Can you believe that this company is so young? It’s amazing how much have been done and how many amazing products released for only two years. And of course what birthday is without celebration. To celebrate the anniversary there will be three days of blog-hops with variety of guest designers and design team member, BIG prizes and exclusive offers (stay tuned to the end of this post). Today is the first day of celebration and you probably came from extremely talented Taheerah Atchia. If not – you may consider starting from the beginning at Altenew blog and see what guest designers and other members of Altenew’s design team have come up with. Today I am sharing three cards I made for this celebration. The first card is extremely easy and quickly to make. I white embossed the city scene from Sketchy Cities America set on black cardstock, cut the scene in pieces and adhered to a white card base using black foam adhesive creating some kind of wall art gallery. Stamped a sentiment I made using two stamps from Sketchy Cities America and Sketchy Cities America 2 sets with Jet Black ink which finished my card. The second card has the same idea – a wall art gallery. I only made the “art” a bit differently. Stamped the city in gray and yellow (so it’s the city one gloomy rainy day and only yellow cabs are give it some color). I used Evening Gray and Warm Sunshine ink. Put my art in black frames, and adhered to a “wall”. The play of wall plays a white card base sprayed with Iced Spruce Distress Spray. I adhered my city pieces using foam adhesive as well and made two side ones to kind of stick out of the wall. And the third card is more colorful. It’s cherry blossoms time now and I wanted to make a card featuring this time of year. I was inspired by a cherry blossoms photo with one branch in the front and all other blossoms at the back our of focus. So to create this card I first inked a white panel with Coral Berry and Evening Gray inks. Then stamped some flowers from Vintage Flowers set using different shades of pink and red. Stamped one branch and flowers so they stand out of the other blossom. To make the background look a bit more our of focus – I stamped here and there the bottom layer of flowers using white ink. Added some details with my white pen and then adhered my panel to a kraft card base. Next I cut a vellum panel and adhered a cherry branch to it. I die cut a branch from Dark Chocolate cardstock using a die from Vintage Flowers set. And to make flowers I first inked a white cardstock with Coral Berry ink, then stamped two flowers also from Vintage Flowers set using Ruby Red ink and die-cut them. I made them this way as didn’t want them to have this white border that die-cut usually have. It would be too much white for my idea. But I wanted to have some white, so added it with my white pen 😉 Added a simple sentiment from Thinking of You set, stamped in Dark Chocolate ink on a stripe of kraft cardstock. Leave comments along the way for the opportunity to win one of THREE prize packs valued at over $100 from Altenew! This amazing prize pack includes not-yet-released stamp sets. The next stop in the blog hop will be extremely talented Donna Mikasa. If you got lost, please go back to Altenew Blog. Gorgeous cards, love the fun backgrounds! So many beautiful designs! I love the “wall art” gallery card…so creative! Beautiful cards, the city scenes are fab. However, the cherry blossom card is definitely my favourite – it’s gorgeous! I can’t pick a favorite because I just love the New York cards (one of my favorite places in the USA) and the flowers are just beautiful…. the look with the vellum is just grand! Each design and layout is superb! Thank You! wow! 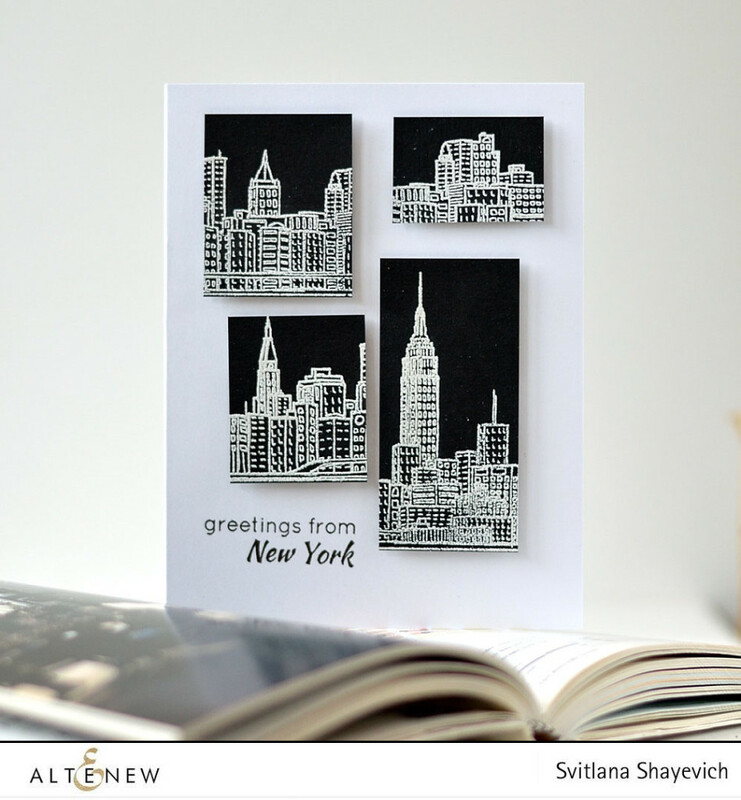 I love your cards so much but that balck and white about New York is stunning! What a talent here with all amazing and fresh new designings! The vellum one is my most fave one! Beautiful cards, love the vellum. Your New York cards are so fascinating! I love the graphic design feel to the cityscape black and white card. I think it is stunning. Both cards are spectacular. Happy Anniversary Altenew! Love the cities scapes stamps, so pretty. These designs are genius!!! Your creativity amazes me every time. I love seeing what you make! Love your cards, especially the cherry blossoms, beautiful! New York City card is great, very cool. Gorgeous cards!! I love the city cards!!! Love your cards and technique, especially the cityscape. thanks for sharing. Such creativity. 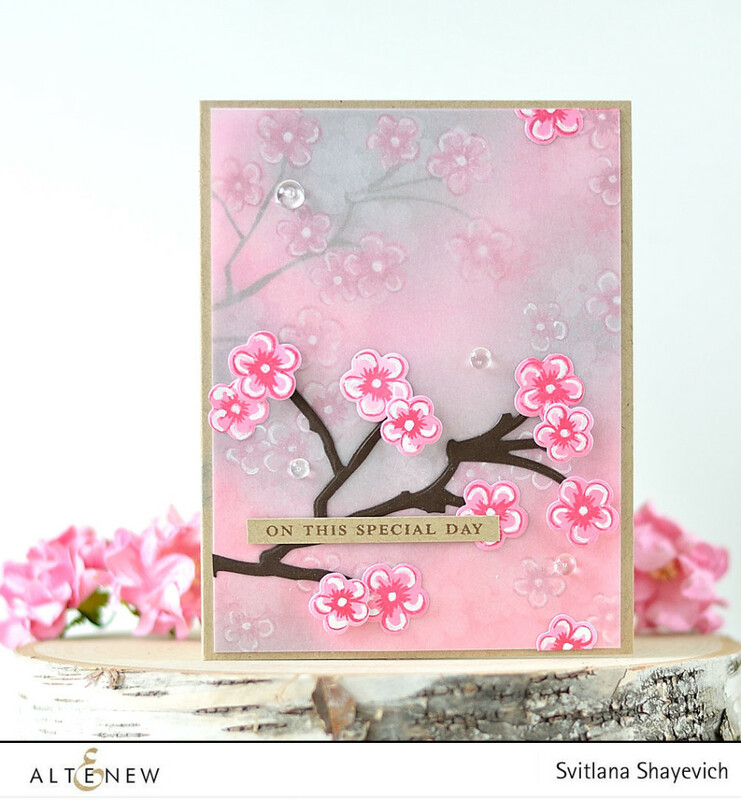 Your cherry blossom card is stunning – love the colors!! A special card for a special day! Your cards are unique and very beautiful. Gorgeous cards. The cherry blossoms certainly seem to pop. All of your cards are beautiful but I really love the cherry blossoms! Beautiful! Love how you and Jennifer have used vellum as overlays! gorgeous! I love the New York cards, and then I saw the cherry blossoms one and I love it too! You have such style! Oh, these are all fantastic! The NY cards are full of wonderful details! Great job!! I can’t choose one! All of them are magnificent!! Beauty! These are fantastic cards! I’d love to see a video of how you did the cherry blossoms card. I absolutely love the black and white graphic card! And then you used the same images for a completely different card. The last card is just so soft and lovely. All 3 cards are really great! Love the wall art idea. The cherry blossoms card is so soft and pretty. I love your use of the warm grey ink on the last two cards. Coral Berry is a great accent to the grey. I absolutely adore the three cards. The first two are so artsy, so very creative and such fabulous ideas. The third one is so very pretty and loving how you did the background. Amazing cards…love them! Thank you so much for the inspiration. Love the city scene and the cherry blossoms! Your “New York” cards are truly exceptional and your cherry blossom card–wow. Using vellum so brilliant. Thank you. The cherry blossom card is stunning. I ❤️ your cards. Thanks. I’m so glad you used that branch. I’ve been wondering how I would use it. You turned a rose sat to look like cherry blossoms. Brilliant. The background is absolutely Stunning. I would have loved to see a video for this one! A really neat way to use the vellum. Thanks for the ideas! Your cards are beautiful and I especially love the city ones, since I come from Brooklyn, NY!!! I can’t choose a favorite from these three cards! The skyline ones are a great way to use those images, and I love the way you used vellum with the branch. Keepers, indeed! Thank you for sharing. Gorgeous cards, LOVE your design layouts! I love the NY card, very fun! And beautiful cherry blossoms, they are in full bloom where I’m at this week. Beautiful cards! I love the Cherry Blossom the most! Both of your card designs are beautiful! I love the wall art idea, it makes the city scapes so much more interesting. The cherry blossoms are lovely with the muted effect from the vellum. I’ll have to try inking the cardstock before stamping to avoid the white halo. Thanks. Holy cow…you’re amazing. Of course, I love skyline cards and these two are the best I’ve see. Simply adore the grey with a little yellow for contrast. Just awesome. But that last card is spectacular. Dreamy and ethereal…like strolling under boughs full of cherry blossoms. You’ve made it come alive with your tremendous skill (and I don’t even like pink but I love nature). What a treat it was to visit here today. Great cards! Love the flowers with the vellum and the skyline stamps are elegant! The greetings from New York was stunning! These are absolutely fantastic! Love the wall art NYC skyline and the cherry blossom is just stunning! I adore how you cut the city scene into pieces and used it that way! Very sleek. And your cherry blossom card is absolutely lovely. Love the skylines in stark black & white monotones … very classy and really packs a WOW punch!! Beautiful cherry blossoms card too – special coz our eldest daughters middle name means Cherry Blossom in chinese 🙂 .. thank you for being part of the Altenew celebrations – hugs from Australia ! Thank you so much, Svitlana, for sharing your beautiful cards with us! The ones with the buildings look like they’d make a great wall picture if they were enlarged. Great idea to color your card stock before stamping and die cutting to prevent the white border. Love the clear droplets! Wow! Absolutely gorgeous cards! Love both art gallery wall styles, the second is breathtaking! Love how you’ve used the yellow 🙂 the cherry blossom card is beautiful as well…love the colors and dimension!! I particularly like the city scapes. Wow! Gorgeous cards! Thank you for sharing these amazing cards. Wow, those city landscapes are so cool-looking! I love the contrast in your post between the bold, graphic cityscape and the soft watercolory cherry blossoms. I love those cityscapes – these would make awesome wall art! All your cards are gorgeous! This is lovely! This is the stamp set that I want, specifically for that little flower :o) TFS! Gosh – three such different cards. I couldn’t pick a favorite. Thank you for sharing your talents on this Hop. Wow, fabulous cards! Love the blossom one especially! Gorgeous cards – love the cherry blossoms! Wow, amazing cards! Using the embossing powder on black for the city scenes is so unique and pretty. And the cherry blossoms are gorgeous. Great cards….I would love to live in NYC! OH my goodness… Your cards are so stunning and breathtaking!! Beautiful cards. I especially love the cherry blossom one. Great idea to use vellum to create a muted background effect. Great cards. Love the New York layout. the Pink card is stunning. oh beautiful beautiful cards! just gorgeous! Fun cards and beautiful cards! Love the cityscapes. That is a very pretty technique. Love your cards will have to check out the rest of your blog. I love both of your cards!!!! the cityscape is sooo differrent ,awesome ..great bloghop… Altenew has great products!!! Cherry blossom card is beautiful! The cherry blossoms are my favorite, now I want to try it! Every single one of these is a masterpiece! The greetings from New York is spot on and I love the colours, the layout, everything and it is another one that I would expect to see in an expensive boutique shop too. Then the cherry blossom – well cherry blossom is one of my all time favourite things. We have a small cherry tree in our garden and it always feels like spring has finally started to arrive as the buds and blossoms appear. AND it has been created in my favourite colours too! I honestly love all 3 of these, the monochrome one looks awesome and then the set looks so different with how you have used it on your second card. The cherry blossom card is wow ! The vellum panel is just utterly perfect ? I love your style! Thanks for the inspiration! Very pretty!!!! Love the gray and pink together!!! Beautiful cards!!!!! Love the look with the vellum…thanks for sharing your inspiration! Great cards! I love most the first one as it is so graphic! Great job! Beautiful. I love the background. Love your cards, especially the black and white city scene. love both the looks – the graphic look and the soft floral! Stunning black and white cards! Beautiful cards. I love the black and white card. I love your cards! The black/white card is so outstanding. I can almost feel the rain in your gloomy NY card. Your cherry blossom card feels like spring. Thank you for sharing. WOW! Love the graphic look of the NY card and the cherry blossom card is just so sweet! I really love this card; it’s so elegant and colorful. Great cards love the panels and the New York skyline so pretty! YOWZA! Love everyone of your creations…..the city scape and the beautiful flowers….lovely! Beautiful cards. Love the simplicity of the B&W card!! Beautiful cards! So many lovely details! Awesome cards, I love the 2 different scenes you created. Such beautiful cards, Svitlana! I love the little snippets of New York, and your cherry blossom card is stunning! Wow! I love them all and they are all so different. I can not choose a favorite. Thank you so much! Amazing cards. The cut up New York skyline has such wonderful impact and the cherry blossoms is so feminine and soft. Great inspiration. Love your floral card today. WOW! Love your cards! The pop of black and white city scene, and then the beautiful layering of color on your cherry blossoms, so amazing! Must give this a try! All of the cards are fabulous. The background is fascinating. Such beautiful cards. The flower one is really elegant! 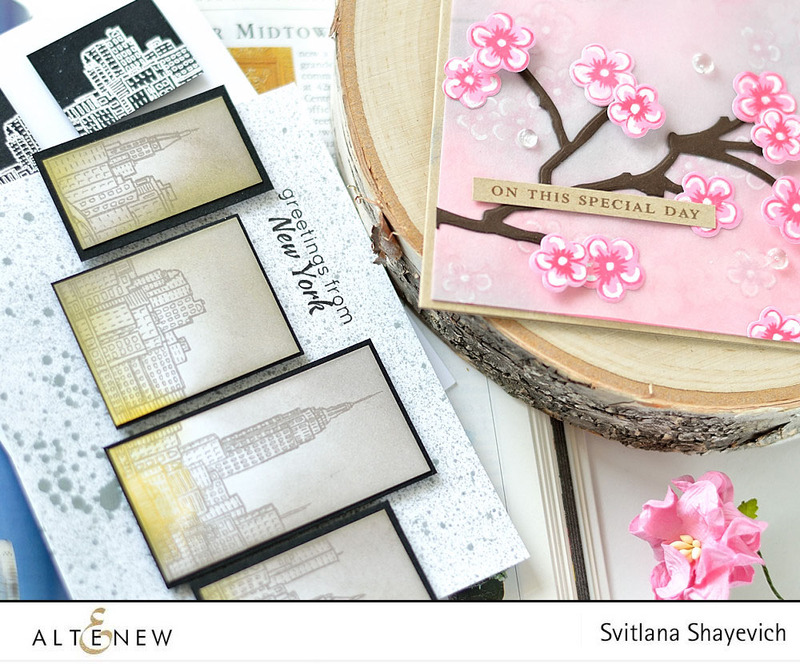 Love the NY skyline cards and the beautiful cherry blossoms card! The cherry blossoms are wonderful. The black skyline of New York is stunning. The second view is also nice, but muted. You cherry blossom card is SO STUNNING!!! Love the muted colors!! The black skyline is also amazing! Love the little flower card. Really beautiful! Love your second card! The colors are perfect. I was shocked when the email came out from Altenew saying it was their second birthday. For a company that has such amazing products, I thought they had been in business much longer than that! I love the city cards as well as the delicate floral! All clever cards. Love your cherry blossom card!! It’s awesome!! Love the muted background! AWESOME cards! Love the city scapes, and the cherry blossom is so pretty. I love your creations! They are very creative and pretty! Great products and a fun Hop! Fabulous – especially that black and white card!!! I love the black/white New York card. Love that Altenew listens to customers and made Sketchy Cities 2 for those of us who live in Seattle! Happy Birthday Altenew! Wonderful city cards and I also love the pretty floral one too! Amazing cards. Love them all! TWO really beautiful cards today! I love the color of the cherry blossoms, and the gorgeous design of the New York skyline! Awesome cards! Love the ideas on the 1st and 3rd cards. Thank you for the great inspiration. Wow! Amazing how all three cards are different and yet equally stunning! So beautiful and delicate. I think I like this the most. Nice job! Love your site, so glad I found you. What a great mix of cards! Love the vellum layering on your cherry blossom card. All I can say is WOW! These cards are stunning! Love your cards! I’ve been trying to think of ideas to showcase my city stamps and will absolutely use this wall gallery technique. Funny how I’ve used this technique for nature themes but hadn’t for the sketchy city stamps. That’s why you are the pro! 😉 Thank you for sharing your talent with us. The city card scenes are so cool and so is your flower card. The cherry blossoms are so beautiful. I also love the cityscapes (which are great for travelers and for man cards). Your cherry blossom card is one of my favorites from the blog hop! It’s beautiful!! Beautiful cards! The cherry blossoms card is my favorite! Great idea to cut up the city images. The black and white is stunning. Love the pink cherry blossom card. Two beautiful cards. Very different but both so much fun. The skyline ones are so simple but so much fun! Absolutely love the flower card!! Can’t find words to express the awesomeness of that card??? I really like all of your cards but I have to admit that I am partial to the cherry blossoms. Having said that, I really do like your other cards too. Kinda classy. Wow…amazing work on these! Love both, but the cherry blossoms are especially stunning. All of the cards are stunning, but my favorites are the cityscape cards! Wow! What a great idea! Cherry Blossom card is absolutely gorgeous. Love it. Cool cards!! Especially like the one with the blossoms – reminds me of cherry trees? Oh those cherry blossoms…love how you added dimension to some of them! All your cards are very attractive.The cherry blossom card is so pretty>Great technique! Cherry blossoms are so much fun! Love how you used vellum on the card. The city cards are stunning! I simply love the cheery cherry blossoms! So lovely! You are such a talented artist! Love the black & white scenes & the wall art is spectacular. Love them both! потрясающе, они все просто потрясающие 🙂 света – это так круто что я прямо зависаю над каждой!!!! Cherry blossoms are here also and our county fair the ‘CHERRY FESTIVAL WEEKEND” is coming up. My head is just full of ideas to use that stamp. The white pen details perfected the card. Great idea. Thank you. Wow all three of your cards are incredible!! Great designs! Love your cards especially the pink one (my favorite color)! What a gorgeous trio of cards! I especially love the “wall gallery” card although I love all of them!! TFS! Fantastic cards! Love those fun ideas and can’t wait to try! Thanks for the inspiration! Love the technique for the New York City cards but my favorite is the Cherry Blossom branch. So pretty and spring-like. Spring in NYC – love the cherry blossoms! I am Canadian so I can only dream what spring is like elsewhere in the world. Right now, everything is still dull and signs of renewed life are just beginning. I think your color choice is really pretty and the card is beautiful. Love your cards. The cherry blossoms are just gorgeous. Love the NY card. Just fabulous. Absolutely love the pinks on those beautiful flowers – they remind me of the cherry blossom right outside of my apartment – one of my favourite things about the springtime! Loving this blog-hop for showing me great work by great artists and great products from AlteNew that I look forward to trying one day! These are gorgeous! I really love the clean graphic look and the small panels of the first 2 cards. Very original. Wow!! Beautiful cards!!! Your skyline cards remind me of Beautiful wall hangings!! The New York landscape was interesting. The cherry blossoms lovely. Well done. Omg, the Cherry Blossom card is amazing. Your cards are both so dramatic and so very different from each other and from everyone else’s! I love, love, LOVE them both! Very clever! All these cards are fantastic! Hard to pick a favorite, but I like the black and white one of New York and the cherry blossom ones the best. Really like the soft look the vellum gives. That cherry blossom card is stunning. So much clever technique to produce such a beautiful effect. Wow. your cherry blossom card is wonderful and love how you used the vellum!! so pretty! What fabulous modern designs with the cityscapes! Nice to see two completely different looks. The cherry blossom card is cheery for spring. Lovely work! Such beautiful cards! Love them all! The city scape cards are so classy and elegantly designed. The lovely spring flower card is absolutely gorgeous…seriously…I love them all! The city skylines are very chic and trendy! I really love the city building stamps, these cards are great. Great cards – especially love the one with the cherry blossoms and how you used the vellum to soften the background – very pretty ! Love your idea to cut the city apart. Such a fun look on both these cards! And the depth you created with the vellum is incredible and oh so pretty! I really enjoyed the cherry blossoms card and the NYC city scape. Such a great idea to frame them instead of just using them as cards. I love the idea for the NYC stamp. Never would have thought to do that. The Japanese cherry blossoms are also beautiful for spring. Love them! Stunning cards. I love the city themed cards. Your cherry blossom card is beautiful with a capital B.
I love all of them. They are unique and inspiring. What beautiful cards. I love the cityscape. Very unusual indeed. Wow! I love your city scene “art” cards. So clever. The cherry blossom card is gorgeous. Thank you so much, you have definitely inspired me. Great job. Love the cherry blossoms! All three cards are terrific. Especially love the city scape and cherry blossoms. Love your card, very delicate. Wow, you presented a wide variety… soft and pretty cherry blossoms vs. the more modern cityscapes. I love them all! Beautiful cards! I love how they are so different, but so compelling. love, love, love the cherry blossoms! My favorite is the cherry blossom card. Just lovely. Omg. WOW! The landscape card is absolutely a WOW!! And those cherry blossom? So so pretty!!! Wonderful idea for the New York cards, Thanks. Three fantastic cards! I love the art gallery idea for the first two and the cherry blossom card with the out-of-focus background is just fabulous! What beautiful works of art! Absolutely gorgeous! I love the NY card – never thought to cut it up like this – fabulous – will need to do that with mine. oh my these are just beautiful.. love them!!! Love the vintage flower card. Anything pink, grabs my attention ! I’m more a flowers’ lover than cities, so I will vote for the 3rd card. I just love it, the idea using the velum is fabulous. Thank you for sharing your creativity with us. 2 totally different cards and both so beautifully done. Thanks for sharing them with us. Your branch with flowers reminds me of cherry blossoms. Very springy. Great cards Svitlana, all different and beautiful. You are so talented. The cities cards are so creative and artistic. The floral card, though, is my fave. It is so ethereal and beautifully colored. I really enjoy your style. The city scape…very simple and elegant. The cherry blossom card it simply beautiful. Thank you. Fabulous cards, you are so talented! All your cards are beautiful. Love the city scene cards. 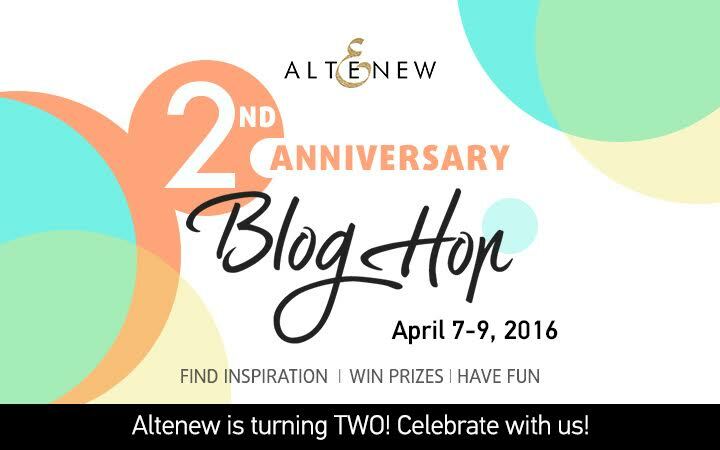 Happy 2nd anniversary Altenew. Thanks for sharing. Great Job on the cards! Beautiful cards. Love the vintage flowers! The cherry blossom card is so gorgeous! These are amazingly creative … thanks for the inspiration! Fantastic cards Svitlana. Love the buildings in those rectangles… great composition on both… the cherry blossoms are lovely! Happy birthday such an awesome, amazing 2 years! Keep it up! Such beautiful cards & techniques! Love your graphic design with the Sketchy cities! Awesome layout! You really created some pretty cards. I especially like the floral card it reminds me the the Cherry Blossom trees. Love the vintage flowers card, thanks for sharing! I like how you cut the city images apart to make those great graphic designs. Beautifully crafted cards, love them!!! All three are literally breathtaking and stunning!! I love your crisp black and white card with the NYC skyline especially. Your ability to be able to create two totally different type styles of cards is amazing! I love all your cards but the Cherry Blossom one definitely stands out to me. Love it! What a beautiful range of cards. I love your style! Beautiful cherry blossom creation…just gorgeous. I can almost breathe in the scent, great job! Great cards. I liked how you broke up the images of the New York stamp for that card and on the cherry blossom card, I likes the use of vellum. Very pretty apple blossom card. If I lived in New York, I would own that New York stamp! Great card. The city card design is genius! Love it! Your cards are beautiful! I especially love the floral card using Vintage Flowers–so lovely!! Amazing cards, thank you for sharing! I just bought painted flowers yesterday! I totally loved these cards – especially those New York ones! Amazing! I love those cards, especially the New York scene. Gorgeous cards & very creative! The cherry blossom is my favorite but I also love the idea of the grey city scape with yellow cab glare illuminating the scene that is awesome! Thank You for sharing them! Oh wow I loveeee the scene! Beautiful cards Love the cherry blossom card. Your cards are beautiful. I cannot pick one I like best, I love them all. Great job. What a great way to use the city stamp. Your city cards are so fun. Your cherry blossom card is incredible. It’s so beautiful. Thanks for the wonderful ideas & inspiration. Wonderful cards! I absolutely adore the black and white NY card! Love Big Apple!!! Just stunning!! Especially I love the flower one!!! I am familiar with the beauty of Cherry Blossom Trees in the East! My sis lived near DC and hence I visited there a few times. Your cards brought back memories of her, bitter-sweet that she is gone, yet blessed by memories with her. Beautiful cards and designs. Altnew and it’s designers ROCK! I loved your cards. Thanks so much for showing them to us. All beautiful cards ! ? WOW! Love the black and white card of NY. Fabulous cards. My favorite is the cherry blossom one. Awesome cards! Two totally different styles and feels…and they are both beautiful! I love the bold, graphic look of your cityscape cards!! Thanks for the inspiration! I love, love, love the background on the apple blossom card. The pink and gray combo with the flowers is so very pretty. Thank you for sharing! What a pretty card. Great for a wedding or Mother’s Day. Thank you for sharing. Love the modern look of the first card, the layout is so pretty! LOVE the special day card. Truly!! I am in awe for the wall city scape cards and the cherry blossom card is so timely and beautiful. Thank you. Wow, I must say your last card is breathtaking! Thank you for sharing! New York or D.C. and the pink flowers. What beautiful choices. The cherry blossoms remind me of my trip to Washington, D.C. Pretty card. Thanks for sharing. Amazing cards! The blossom card so gorgeous and love the cityscapes! Nice job on all those! So sparkle-tastic! I’m new to cardmaking and just purchased the Brush Art Floral and Layered Lily sets and dies. Very excited to try them out. Awesome cards! I feel as though I have been to the art gallery in New York and to see the cherry blossoms in D.C. Thanks for the trip! So in love with the concept of the gallery wall cards, they look fabulous! Love! such unique ideas. Love the gallery card. These are all lovely. The cherry blossoms especially. Awesome cards. I especially like to cherry blossoms card. great cards. really love the New York. cityscapes. Wow! I’m very impressed by your gorgeous cards! Your talents combined with the fabulous Altenew stamps equal outstanding creations! Thanks for the wonderful inspiration! Great cards but just love the layout & pop you achieved on the 1st card. Awesome! As an architecture graduate I really enjoy the cards you’ve made with the buildings. Very eye-catching. All of these cards are terrific! I love what you did with white on black, also love, love the cherry blossom card. Love the city scapes and the blossoms card is gorgeous! Love your cards! But cherry blossoms …it’s awesome! So realisric, so tender and so cute! Fantastic job! I love all 3 cards but especially the black & white New York card. Fabulous inspiration. Love the cherry blossom card. Very pretty. These are gorgeous! Fabulous cards! Love those blossoms! Beautiful cards! Black and white is my favourite! Wonderful samples of what you can do with the Altenew stamps. Thanks for the inspiration!!!! nice designs, all of them are beautiful! LOVE your ELEGANT city scapes, ADORE your GORGEOUS cherry blossoms, they look DELIGHTFUL with the vellum panel – WOW!!! Very delicate looking card. Love it. Sveta, i’m in love with your works, your ideas are always so fresh and i love how you stretches your stamps, it’s a pleasure to see what’s new you can bring to life! Love your NY cards! Beautifuly put together! I love your cards, especially the cherry blossom card. Beautiful coloring! Such a stunning use of the landscape building stamps, awesome! Thanks for sharing. Those skyline cards are so cool, love the graphic look of them. The flowers and branch is amazing! I love the softness with you use of the vellum. Wow! Love how your first two cards look like mini art displays! Love the panels on the first two card…great idea to make it look like an art gallery. Pretty floral card. I love your idea of bringing one branch into focus by using vellum! How clever! Gorgeous cards! I love the first one is nice and masculine! I am a small town gal but could almost wish for a big city life just to make these two cards! But I must say the beauty of nature in your blossoms draws me back home. Gorgeous cards! Love the vellum card! ? The cherry blossom card is a stunner. I love flowers and this card is an inspiration for me. wow, the skyline ones are fantastic, and so is the cherry blossom one too. Loved the card with cherry bloom. Wonderful, love the city and cherry blooms. Thanks for sharing. WOW! Love the cards. Especially the pink cherry blossom. . BEAUTIFUL! I really love the pink blossom card! Beautiful design! I like the graphic style of the sketchy cities cards. The blossom card is gorgeous. I love the vellum layering. Gorgeous cards! I especially love the cherry blossoms one with the vellum layering! Love the dimension you’ve created with the cherry blossoms behind the vellum. The skyline cards are stunning. Wow, beautiful cards! I wish you had made videos so I could see your creative process! Love vellum on a card! So pretty! These are just gorgeous! Can’t pick a fav! Too too pretty to have to decide! I love your beautiful cards! Especially the city scape one…. love the background and the stamps! Thanks for sharing! Lovely, colorful vellum card! Gorgeous stamping! Beautiful cards! Love the New York scene! I really like the layers on your floral card… beautiful! The vellum layer makes the last card just perfect. Not cherry time here yet, but they are some of my favourite flowers! Wonderful cards! Really love the gallery wall look! So fun! beautiful set of cards… the first two are so clever!! WOW Svitlana, you have been B.U.S.Y!!! All are fantastic and the last one is SO PRETTY! Great work! Ooo… I love cherry blossoms and the buildings. All of the cards are awesome! Thank you for sharing! Love all of your cards especially the pretty in pink! Love your cards. So talented. Your cherry blossom card is divine! Love your cards so much ! The wall art is a good idea, love it ! oooo i love the texture on the background for your second NYC card! Wall art – what an awesome idea!! Love the cherry blossom card – super cute!! Both of these are wonderful cards! Love the cherry blossoms and the museum cards are a great idea! Love your cards–especially the black and white one. Stunning! Love the New York cards! Very graphic. Ahh those New York cards are so pretty! I love your cards. They’re beautiful. Oh my goodness! All of these cards are stunning, exquisite, and gorgeous! Love the layouts and overall design of each of them! I have to say though that my favorite is the flowers! Looks just like real cherry blossoms which I love! And those pink colors are so precious! This was my first time to your blog but after seeing these you have a new blog follower! The idea with vintage flower set is lovely!! Love it! Both cards are amazing! Now I am definitely getting the sets with buildings from diff cities!! Your cards are so creative! I REALLY love what you did with the City Scapes – that is so clever and eye-catching! Thanks for the inspiration. All of these are beautiful! I especially love the white heat embossing on black paper. Gorgeous! Cutting the city scenes into blocks was brilliantl. The cherry blossoms look so authentic! You are very talented – I love your style! All of your cards are absolutely gorgeous! Love, love the New York cards and the cherry blossoms are gorgeous! I LOVE cherry blosoms….they smell awesome in spring, so that card jumped out at me….very pretty! I just love your skyline card designs! Love all of your beautiful cards. Especially the first New York one. Oh I just love the cherry blossom card, its SPRING !!!! thank you for sharing! Your cherry blossom card is beautiful, but not to take a back seat to the New York one. Love them both. Wonderful cards! I love them both! All of the cards are very nice. I particularly like the second card. I love how the warm sunshine ink comes up through the cityscape. Aren’t the sketchy cities stamps so much fun? Love the monochrome cityscapes, and the background of your cherry blossom is so pretty. Beautiful card coloring and designs! Oh my all so stunning! Love the cityscapes and the cherry blossoms. Thanks so much for sharing! Fabulous cards! Really like the cherry blossoms, but those city scenes are awesome! Gorgeous cards, love them all. Thanks for the great inspiration! Your cards are just Stunning!!! Omg! WOW! I love all three cards. So amazing! Great cards. I like the gallery wall type effect on the cards. Wow, thanks for sharing your lovely cards. Love them all. All of your cards are just awesome. So pretty. Wow, stunning cards. Love the cheery blossoms. Love the colors in the cherry blossom cards and what a great idea with the graphic layout of the city scene card! Such a fabulous mix of colours and designs. Each are stunning in their own right. Fabulous Work – these cards are lovely! TFS 2 year anniversary ! Happy Dance! Your second card is beautiful with the pretty pink and vellum!! I really love your second cityscape card even more…haven’t seen anything like it and is very cool!! All of your cards are so pretty. The vellum on the cherry blossom softens the background and really pops the die cut pieces on top. Love all your cards especially the cityscape! LOVE Cherry blossoms. Beautiful card. The black and wite is my favourite! I love your cityscapes cards! Then the idea of having the softness of the cherry blossom background only to have the boldness of them on the vellum is very unique. Love it!! OH MY so fantastic. I love all cards but the cherry blossom blew me away!! Your cards are fabulous! Very Arty! Your cards are amazing! I love the art gallery designs – so different. The cherry blossoms are perfect! Gorgeous cards. I love the cityscapes! Lovely cards. I love the cityscapes! Great ideas and great cards. Love the city cards. What a great idea to present the images that way. I know it’s redundant, but I love the background. The cherry blossoms look beautiful and the coloring is great. Love the cityscapes too. This is my first time to see your work and I am DELIGHTED!!! Your ideas are so CREATIVE and UNUSUAL… I absolutely love the first set of black and white city scape…what a GREAT IDEA!!! I will for sure be following you in my email!!! I visit your website thanks to the blog hop. And wow; you created great cards ! The cherry blossom card is a beauty; but the two New York-cards are real eyecatchers ! Great and original design; I love that art-gallery-wall ! Thank you so much for sharing your talent !! Your cards are very pretty. Really liked your cards!! Thanks for sharing! This is my first time to your blog :), it was a treat! Your cards are so pretty!! I love how you blocked the city cards!! Gorgeous and stunning cards! The cherry blossom card reminds me of a photo I have that my dad took while stationed in D.C. of the cherry blossoms there. They are so pretty! I just love the sketchy cities on the white cardstock. It really stands out! Beautiful designs and colors. Love how you used the products. Love the cherry blossom card! New York is my home town so I simply loved your city scape design. The Cherry Blossoms are beautiful, love the idea of ‘blurring’ out the bakground. I like how you used your stamps and made the “wall art” cards. Fun idea. Your floral card is so lovely, the colors wonderful. Thanks for sharing your ideas with us. I love both of your cards but I especially love the city scape in black and white. I love these beauties! Especially the layout of the first and the soft background of the cherry blossoms! Very pretty card! I love the pink and the cherry blossoms. Lovely! I love the cherry blossom card- beautiful! I like how you made the large skyline stamp work in small pieces, almost like a gallery effect. Very nice. The layouts for the New York City cards are really cool. The cherry blossom background is awesome. It really makes the card stand out. SO pretty. The gallery card is such a great design! Love the cherry blossom stamps! Love the cherry blossom card. Love the cards…the NY city cards are fantastic but i love the vintage flowers card. All these cards are lovely but the cherry blossoms card just caught my eye. Love your black and white skylines! Great cards. I especially like the cherry blossom card. The white ink that you used really added that certain special something. Thanks for sharing. Love them all, especially the cherry blossoms! Great cards! Thanks for explaining the technique for the cherry blossom card. It is really stunning. Beautiful cards! The first two look like wall decor! You are an amazing artist! Like artwork on a wall. Great color combos. Will definitely be following you! Congratulations to Altenew! Love these cards all for different reasons! I love that black and white skyline card. It just really pops! Love the cards, especially the cherry blossoms. All of your cards are gorgeous, especially the first card in black and white, its spectacular!!!! Very nice city cards and I like that each is different than the other! The flowers are nice too! I especially like the layers with the vellum and more flowers. Beautiful cards!! The black and white landscape is my favorite. I am loving the branch with blossoms in pink. Great cards! The cityscape cards are such clever use of the set and I just love the pink blossoms! Thanks so much for the inspiration! All your cards are lovely…the “galleries” are perfect with the city scenes, and the cherry blossoms are so springy.? Beautiful cards !! stamp sets are Amazing! Thanks for the inspiration! Omg- love those sketchy cities- they look so classic! Sooo cool city skylines and the blossom card is just gorgeous! Thanks for sharing! WOW all your cards are amazing. Totally love the out of focus background on the last one. The first two cards look like gallery walls, very cool. And I love the cherry blossom card, beautiful. Wow! These are gorgeous!! ??? I absolutely love them all. So inspirening. lovely, very pretty! I love your cherry blossoms! Amazing cards, Svitlana! I love how you’ve cut up the city skyline, very creative! Gorgeous cards, love the blossom cards so much and the way you have them popping off the card is so inspiring. Amazingly beautiful and artistic cards. I love the Wall Art cards, so clever! Simply beautiful. Thank your for your inspiration. Wow your cards are so diffierent! From elegant and chic to rich and gorgeous! What beautiful inspiraton you have given us! Thank you! Great cards – love the use of vellum on your second card. I like how you put together the I love New York card. Very nice. WOW! I love your designs!! Your cherry blossom card is stunning. I love the idea of creating a soft background by layering vellum over your stamping. Oh, my – both cards are so different but stunning in their own way. Wonderful cards! I love how the first ones look like art installations! Absolutely love the cherry blossoms! Beautiful cards! Love the New York card! So elegant with the vellum panel to showcase the cherry blossoms! Love it! It’s spring!!! Love Altenew! Amazing card! Thanks for inspiring us with creativity. amazing cards! thank you for sharing them! Very cool cards! I love the contrast and color that builds on a subtle background! Love your take on the Art gallery style cards. Thank you for sharing. Love these – pinning them for later! Beautiful cards. Love everything about the cherry blossom card – the background, color, layers, design – Stunning. Beautiful! Love the skyline on black with white! I like all your cards but I love the city skylines best! I love the way you created the out of focus effect! Beautiful work! That cherry blossom card is amazing! I love everything about it! Great cards. The flowered one is beautiful (my favorite!). Love the background you created using a vellum overlay; the mix of pink and grey. Thanks for sharing. Beautiful ideas! Thanks so much for sharing!! Gorgeous projects!!! Love the sketchy cities! Your cards are inspiring. I love the city examples? The cherry blossom card is beautiful. Reminds me of the trees in Washington. I love how you used the vellum to create such a soft background. So beautiful! I love the pink card!!! Gorgeous! My new daughter in law, Antonina is from the Ukraine! She is a joy! Absolutely gorgeous cards. Love your creativity. Thanks for the inspiration. Cool products! You captured the NYC spirit so perfectly in those two cards, which is one of my favorite spot in the world! Your cherry blossom card stole my heart! It is so very beautiful and has inspired me to do one with a Japanese flavor. I love your design style. Much as I love Altenew’s floral stamps, the sketchy cities are just fab and the black and white card is wonderful. Oh my what a stunning and beautiful card!! I love it!! Stunning and beautiful card!! I love it!! Sorry for the repet comment…my email was wrong in the first comment! All your cards are lovely but I’m in love with the dreaminess of the second card! What lovely cards! Especially the beautiful cherry blossom card! The layers of the card add so much dimension and interest; making it a stunning card! I also like the black and white city scapes — simple but still lovely. I love cherry blossoms, so I fell in love with your cherry blossom card. Just beautiful! Your cherry blossom card was beautiful. The dimensional layers made for a really gorgeous effect. The design and techniques of both cards are so inspiring! Lovely cards. i especially like the black and white new york card. Love your city wall art and the cherry blossom card is gorgeous! Thanks for sharing your talent! Love all your cards—-very pretty!!!! Love what you did with the Sketchy Cities America stamps! I love your cards!! The art wall cards are so clever and look amazing. And the cherry blossom card shows what I love about spring in a beautiful card. Thank you for sharing! I love love your second wall art!! Totally awesome designs. Love your cards, Svitlana! LOVE your cards! They are so unique and love how you made the stamps look so different. I finally see a reason to get the “city”stamps. Thanks for sharing. love the greetings from New York! Веточки сакуры очень нежно вышли, фон – загляденье! А Нью-Йорк – просто шикарен! Стильно и геометрично! Both those stamp sets are awesome. What you did with them is even “awesomer.” Thanks so much for sharing. I was INSPIRED!!!! Both cards are stunning! Thanks for the inspiration! Great cards, the art wall idea is so cool =) TFS! Gorgeous, Love the colours and flowers. A fantastic assortment of cards! Equally love the cityscape and cherry blossom. Hi, I just LOVE the cherry branch you’ve made. Goodness me your cards look amazing!! Love the arrangement of the city scene! 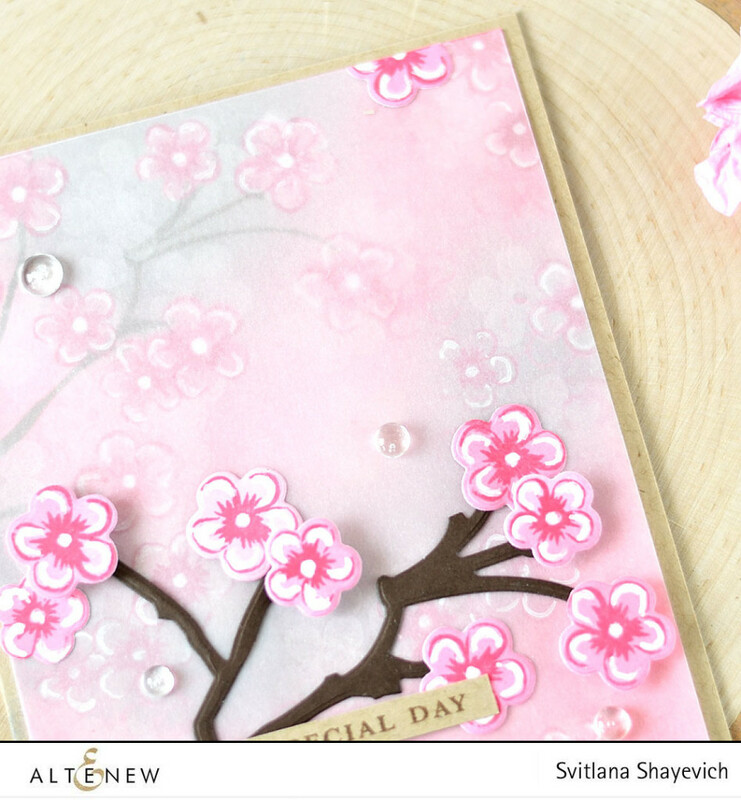 And absolutely love your use of vellum on the cherry blossom card!… It’s way to beautiful!! Absolutely love both of these card!! I like the way you break up city skies. So very prettY! Love it! Oh my! Love the city scenes and the cherry blossom card is stunning! Sure do love the flower cards. Beautiful. Love the cherry blossoms. Looks like this blog hop has worked and I’m going to have to get some stamps, dies and inks. Wow! Your cards are clever and inspiring. Beautiful. Gorgeous cards. My favorite is the cherry blossom card. I am going to miss not having any live cherry blossoms this year. We got a spring snow over the weekend and mine all froze. I will have to enjoy looking at your beautiful card! The panels make such dramatic cards, and the vellum is such a lovely way to soften the background and make the main image stand out! Beautifully done, Svitlana! Absolutely stunning and fun cards! Love the effects you created here, well done! 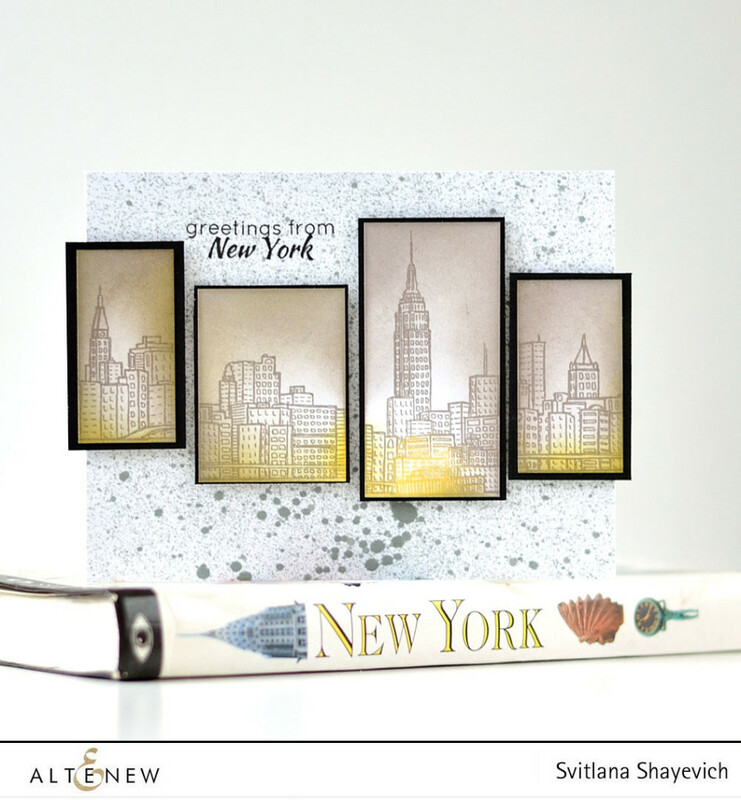 I love the grey and yellow New York card!!! Love, love, love the cherry blossom card! Have this set, and will attempt to recreate what you did!! Great tip for eliminating the white around the die cut!! Those cards look so different, but I like them all! What a nice way to make your cards, they are simple in colors but that´s why they are so elegant. I’m always inspired by your creations. Thank you. OH MY GOODNESS!!! Your cards are stunning and just so amazing!!! Oh my gosh, I so love your artistry and will be back for more ideas! Thank you. Sweet Cherry Blossoms & love the city card as well!! LOVE the spring colors, bright clear colors! Gets me in the mood to craft away!! I love your cards but my fave is the cherry blossoms, that is just beautiful! Gorgeous! I especially like how the distress spray turned out on your second card. Beautiful collection of cards! The vellum looks very cool! These are great! Especially love your cherry blossom card – just stunning! I love the cherry blossom card. All of them are beautiful. Great inspiration. I love the difference between the dramatic NY card, and the artsy one. And cherry blossoms are always beautiful. Your cards are great! Love the cherry tree one! Света! Умопомрачительные идеи открыток! Я осталась без ума от картин города на стенах. Черно-белый вариант просто бомба! А второй-такой романтичный) Особенно понравилась фишка со светом от такси! Чумааа. И, кстати, выход за рамки основы смотрится очень круто! Это расширяет границы нашего сознания. Третья открытка ну такая весенняя. Такая пинки пинк. Очень приятные тона. И очень элегантно вышло! Спасибо тебе за вдохновение! И поздравляю всех любителей Алтенью. Они правда чудесные. На стиле! Soooooo pretty! Love the colours! Awesome cards, I liked the contrast in the black and white city card. Your cards are amazing! I love your comment about the yellow cabs adding color to the city. Such a neat wall art card. And your cherry blossoms card is stunning! Terrific cards Svitlana! Love the soft florals and the graphic buildings. Beautiful projects, love your designs. Great cards. Thanks for sharing! This is a wonderful card!! I love the cherry blossoms reminds me so much of my home. You did an amazing job! I love your idea of wall art gallery on the cards. So nice! Love the skyline stamp! I love the pink vellum card. So delicate. Wow your cards are stunning. Of all the ones you share the last one with the cherry blossoms is my most favorite. It is totally breath taking. Wow. Love the softness and all the colours together are so complementary to each other. Congrats on mastering the art of cardmaking. Thank you for inspiring. I’m a “flower” girl so I love your Cherry Blossom card…..however both are stunning. Absolutely gorgeous cards. The cherry blossoms is my favorite. Thanks for sharing. Beautiful cards – love them both but the city scape one stands out for me. So very creative,thanks for sharing! Wow I just love the New York cards!!!! I am particularly attracted to your New York skyline cards! I also love vellum, nice job! I really love all your cards. I am in love with your cherry blossom card. The New York cards are very pretty! Happy Birthday! I wish you lots of ideas and inspiration too! Pretty cards!! I just love the pink flowers one! Too good! Wow this is totally Stunning! love the design and the Gorgeous Colours so soft and Beautiful! Love all the cards. Cherry blossoms one is so beautiful. So lovely, especially the blossom card. I have the same set and now I have to try your technique for coloring the card stock and using a white gel pen to highlight areas. Thank you for the inspiration. My favorite is the cherry blossom card. So pretty. Lovely cards. Great ideas for using the New York stamps. Thanks for sharing. What a fabulous line up of cards! Love what you did with the skyline set. Wall art. . .cherry blossoms. . .truly amazing!! Thank you for sharing your beautiful art and cards! WOW! This is a technique I will have to give a try, it is beautiful. love your cards, they r different and very pretty. I love what you did with that city scene, but the blossoms on the branch is stunning–I’ve been working on a similar card-same colors and everything! AMAZING cards! LOVE the cityscape cards especially! Wow! These cards are absolutely beautiful! Those cherry blossoms are definitely going on my wish/shopping list! Thanks so much for sharing…. spring and urban card, two type but every beautiful. Stunning cards!! I love them all, but my favorite is the cherry blossom! I think because it makes me feel like spring could actually be on the way. lol Thank you so much for sharing!! The blossoms are just lovely. Great job! The blossoms are just lovely. Great job! Love the pink tones. So cute, my favorite blossoms are cherry blossoms :)))) these cards look like art canvases. Thank you for the inspiration. I love the little canvas effect on the city cards! Wonderful cards! I love the cityscape cards, but the cherry blossom card is my favorite. It is simply gorgeous. Thank you for sharing the details.